On October 20–21, 2009, two road safety audits were conducted in Lee County, Iowa: one for a 6 mile section of County Road X-23 from IA 2 to the south corporate limits of West Point and one for a 9.7 mile section of County Road W-62 from US 218 to IA 27. Both roads have high severe crash histories for the years of 2001 through 2008. Using these crash data, the Iowa Department of Transportation (Iowa DOT) has identified County Road X-23 as being in the top 5 percent of similar roads for run-off-road crashes. 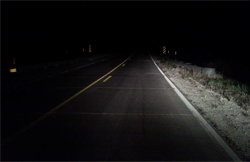 The Iowa DOT lists County Road W-62 as a high-risk rural road that has above-average crash numbers and is eligible for funding under the Federal High-Risk Rural Road Program. Considering these issues, the Lee County Engineer and Iowa DOT requested that road safety audits be conducted to address the safety concerns and to suggest possible mitigation strategies.